Sunderland's Capital One Cup dream ended in heartbreak as they lost out against Manchester City at Wembley. The Black Cats' 41-year wait for silverware goes on, but Gus Poyet's side can take pride in their performance against Manuel Pellegrini's star-studded City side. They pushed City all the way and led for half the game thanks to Fabio Borini's early strike. But City turned the game on its head in the second half, with Yaya Toure and Samir Nasri both finding the net in a little over 60 seconds, 10 minutes after the interval. And, as Sunderland threw everything forward in search of an equaliser, City sub Jesus Navas scored in the final minute to make sure the cup went back to the blue half of Manchester for the first time since they triumphed against Newcastle in the 1976 final. Poyet made three changes to the side that lost at Arsenal, with Wes Brown returning from suspension in place of Santiago Vergini, Lee Cattermole replacing the cup-tied Liam Bridcutt and Seb Larsson coming in for Jozy Altidore. That final change meant Larsson played in central midfield with Borini playing as the central striker and Jack Colback shifting out to the left flank to fill the gap left by the Italian. Pellegrini made two changes to the side that beat Stoke last Saturday. Costel Pantilimon replaced Joe Hart in goal, while fit-again Sergio Aguero returned at the expense of Alvaro Negredo up front. After a high-tempo start from both sides, Colback had the ball in the back of the net in the eighth minute, but the flag had long-since gone up for an offside decision against Borini who had delivered the low cross he tucked away. A minute later, City threatened for the first time as Aguero tried his luck from just outside the area but Vito Mannone was quickly down to his left to make the save. But the Red and White half of Wembley erupted in the tenth minute as Borini gave the Black Cats the lead. Ex-Man City winger Adam Johnson played the ball into the right-hand channel for Borini to chase, he outmuscled Vincent Kompany just inside the penalty area and then from a tight angle steered hit shot past the advancing Pantilimon with the outside of his right foot. It was a brilliant finish and while the fans in blue behind Pantilimon's goal were silent, the 31,000 fans who had made the journey from the North-East went wild. City were a threat on the break, and in the 26 minute Aguero raced away down the right and played a low ball in for Nasri which the Frenchman controlled before getting a shot away but Mannone was equal to it. Yet Sunderland still looked the more dangerous of the two sides, and City were thankful to scramble away a dangerous low cross from Johnson just before the hour. And the Black Cats should have gone in 2-0 up, when Borini found himself through on goal with only the keeper to beat – although he should have been flagged offside when Larsson's flick put him in. Borini galloped into the area but just as he was about to pull the trigger, Kompany came from nowhere and made a brilliant sliding tackle to put it out for a corner. 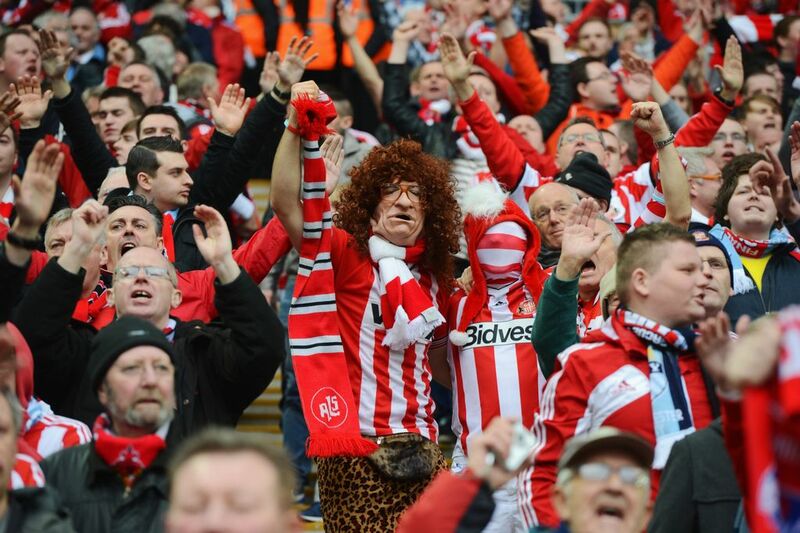 Sunderland deservedly reached half-time ahead, and the Red and White fans were in full cry. But the game changed in the space of a little over 60 seconds early in the second period. City took the game to Sunderland after the interval and their pressure paid off in the 55 minute – although it took a world class strike from Toure to get them back in the match. When the ball came to the Ivory Coast international 25 yards out, he wrapped his foot around it and curled a looping shot over Mannone and into the top left-hand corner. The goal from nothing stunned Sunderland, and before they knew it they fell behind. This time it was a quick counterattack from City, with the ball played out to Aleksander Kolarov on the left, John O'Shea got a toe-end to his low cross but that only diverted it into the path of the oncoming Nasri and he fired an unstoppable first-time shot just inside the left-hand post with Mannone rooted to the spot. Sunderland tried to come back at City with Colback setting up a shooting chance for sub Steven Fletcher in the 71 minute, but the Scot's effort was straight at the keeper. Kompany could have sealed it 10 minutes from time when he got on the end of Nasri's right-wing corner, however his diving header went inches past the near post. Fletcher had a great chance to level in the 88 minute when Mannone's long free-kick was nodded down to him by Alonso at the far post, only for the striker to try and check back onto his favoured left-foot and he could only miscontrol and watch as the ball dribbled out for a goal-kick. City made sure of victory in the final minute, however, as they caught Sunderland with a five-against-two break. Toure raced forward through the middle and fed the ball through for Navas inside the area, and he sidefooted past Mannone and into the bottom right-hand corner.